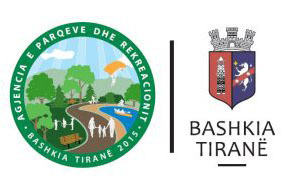 Mësimet e para në Trombon i fillon në Shkollën e muzikës Prenk Jakova – Prishtinë me trombonistin Luan Shala, 2002/2006 përfundon studimet në Akademin e Arteve të Bukura Tiranë dega Trombon me Prof. Alban Zadeja, në 2010 përfundon studimet Master për Trombon në Fakultetin e Arteve – Dega Muzikë në Prishtinë me trombonistin Prof.Kiril Ribarski.Nga viti 2002 angazhohet në orkestrën e Filharmonis së Kosoves dhe tani është dhe udhëheqes i sektorit të Trombonave pranë ketij institucioni.Nga viti 2003 Trombonist i parë dhe udhëheqës i Trombonave në BIG BAND-in e Radio Televizionit të Kosoves, Trombonist udhëheqës në Orkestrën frymore të Forcës së Sigurisë së Kosoves – FSK. 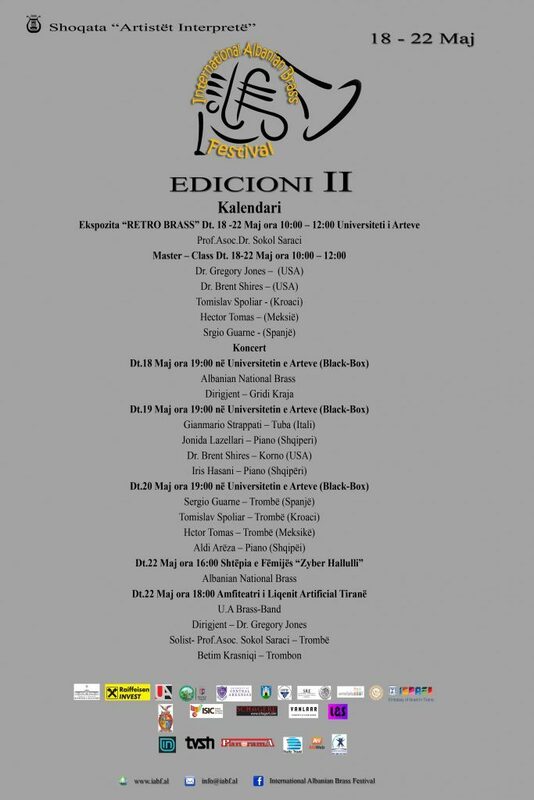 Themelues i Ansambleve të para të tungjit në Kosovë si Kuarteti dhe Ansambli i Trombonave, Kuintete Tungji, bashkëthemelues i Ansambleve Prishtina Brass, Kosova Brass si dhe bashkëthemelues dhe organizatorë i Festivalit ndërkombëtar të tunxhit Kosova Brass Festival. 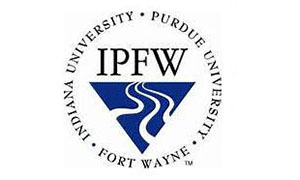 Dr. Gregory Jones serves as the Chair of the Indiana University-Purdue University Fort Wayne Department of Music following 28 years at Truman State University as Professor of Music. He holds music degrees from Florida State University, the University of North Texas, and a Doctorate in Music Performance and Literature from the Eastman School of Music. 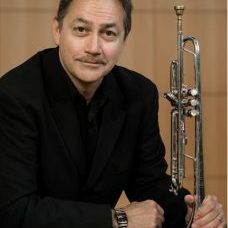 His wide variety of performance experiences as a trumpet player include the Kansas City Symphony, the Moscow Radio Orchestra, the Rochester Philharmonic, the Missouri Chamber Orchestra, the Eastman Wind Ensemble, the Texas Baroque Ensemble, the Grand Teton Seminar Orchestra, Wynton Marsalis, Allen Vizzutti, Al Jarreau, Audra McDonald, Bill Conti, Joshua Bell, the Dallas Cowboys Band, and many others. He has recorded for National Public Radio and performs often as a soloist or conductor. Dr. Jones has served as an artist-in-residence in Greece, a recipient of a Senior Fulbright Grant from the United States Information Agency and the Council for International Exchange of Scholars and has been a member of the Fulbright Selection Panel in Washington, D.C. Since the fall of 2000, Brent Shires has played third horn for the Arkansas Symphony Orchestra. 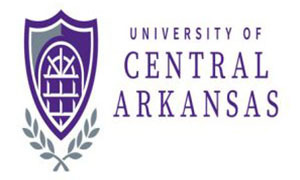 He arrived in the state in 1999 to serve as the first full-time horn professor for the University of Central Arkansas, where he teaches horn lessons and serves as Brass Chamber Music Coordinator. He also teaches education-related classes such as high brass methods and brass pedagogy, and some courses in music theory and history. Brent is an active performer outside the ASO as well, playing principal horn with the symphony orchestras of Conway and Pine Bluff, and is the founding hornist of Pinnacle Brass, the resident quintet at UCA. 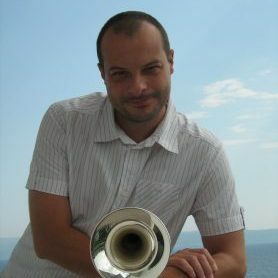 In the summers, Brent is a horn faculty member at Dixie Band Camp hosted at UCA, and Blue Lake Fine Arts Camp in western Michigan. Brent grew up in the suburbs of Rochester, New York, where musicianship was encouraged early on by his school and parents (who now live in Little Rock). His mother gave him piano lessons for two years before he started on the horn in the fifth grade school band. In addition to weekly horn lessons, band and youth orchestra, Brent picked up the trumpet and learned jazz style in high school. 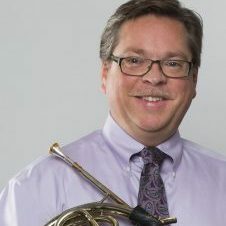 Dr. Shires went on to earn his bachelor’s degree in music education at State University of New York – Potsdam, the MM degree in performance at Northern Illinois University, and the Doctor of Musical Arts from the University of Illinois, with research focusing on original works for solo horn and wind band. He also spent one semester studying at the Birmingham Conservatoire in England. His horn teachers include W. Peter Kurau, Roy Schaberg, Norman Schweikert, John Fairfield, and Kazimierz Machala. Brent has taken honors in several competitions – two university concerto competitions as a winner, and as a prize-winning finalist in the National Young Artist Competition of the Midland-Odessa Symphony. He has performed throughout the U.S., Europe, Australia and China; and has held positions in the American Midwest with the Green Bay Symphony, Manitowoc Symphony, Peoria Symphony, Champaign-Urbana Symphony, and Sinfonia da Camera. Dr. Shires serves the International Horn Society as Regional Workshop Coordinator and Arkansas Area Representative. 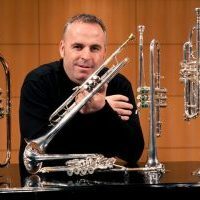 He is an endorsing artist for C. G. Conn horns, and performs on the Conn 8D. Brent lives in Conway with his wife and accomplished pianist Terrie, and their two daughters. In his spare time, he enjoys studying languages, remodeling his home one room at a time, leading a church group and helping out his neighborhood association. 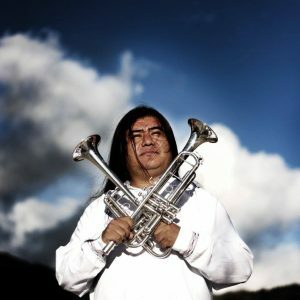 Began his musical studies at the Musical Training and Development Center of the Mixean Culture in Tlahuitoltepec, Oaxaca in México (“CECAM”) at the age of six years old. While he was in this institution, it was playing for the Philharmonic Band where he got the opportunity to play in multiple stages locally, within the State, throughout the country and overseas. In the pursue of his musical career, he attended then the Municipal School of Music in the city of Veracruz in 1996, and actively playing for the “Daniel Ayala” Youth Orchestra. 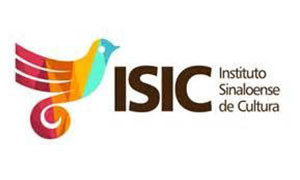 In 2001 began attending the University Of Vera cruz School Of Music located in Xalapa city under the teachings of Maestro Timothy McKeown.In the following year of 2002 he joins the Youth Symphony of the State of Veracruz, previou sly S.E.C. 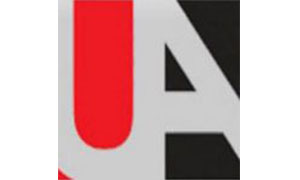 from 2002 to 2004. 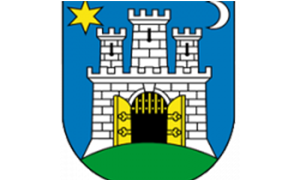 In the summer of 2004 regularly played as a guest trumpet for the Xalapa Symphony. 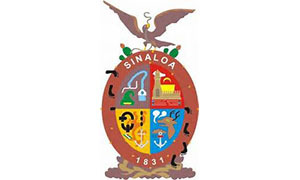 During the summer of 2004 he then became as part of the trumpet section of the Sinaloa of the Arts Symphony Orchestra in Culiacan. Titled with the highest marks by the Conservatory of Aragon with the phD professor Ángel Millán Esteban. Also, he has extend his knowledge with remarkable musicians as Douglas Prosser (soloist in Rochester Philharmonic and professor at Eastman School, Rochester NY) and Rudolf Korp (soloist in Torkünstlerorchester Vienna). 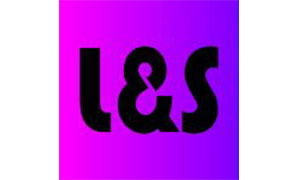 Has collaborated with numerous formations as, Les Arts Symphony Orchestra, Murcia Symphony Orchestra, Extremadura Symphony Orchestra, Euskadi Symphony Orchestra, Orchestra of the Schwelig-Holstein Musik Festival, … and has participated in festivals in Spain, Portugal, France, Italy, Taiwan, China, Switzerland, Austria, Germany and Turkey. As manager, he has been Director of the Conservatory of Music ‘Miguel Fleta’ Monzón (2006-13), founder of the Monzón Symphony Orchestra (2006-11) and he’s the creator of the ‘Orquesta Reino de Aragón’ in 2011 (Kingdom of Aragon Symphony Orchestra) He’s soloist in Kingdom of Aragon Symphony Orchestra and member of brass quintet Be Brass. 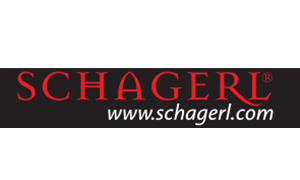 He develops its work teaching as numerary professor of the Government of Aragon and he’s an artist of the prestigious brand, Schagerl. Born in Ancona, he gives concerts as a soloist, in chamber ensembles and orchestras. 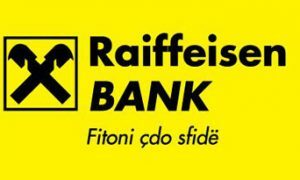 He has recorded for Rai, Radio Vatican, Sky Classic, recorded for the record company Concert-Music Media and published by the publishing house Academy. 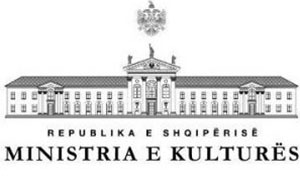 As a soloist he has performed under the baton of Maestro Leonardo Quadrini accompanied by the Symphony Orchestra of Bacau, the Bulgarian National Symphony Orchestra, Tchaikovsky Symphony Orchestra (Russia, Udmurtia), from the Campania Chamber Orchestra and lately by State Philharmonic Orchestra of Vidin in Bulgaria. He has given recitals in Spain, Germany, Bulgaria and Slovakia. 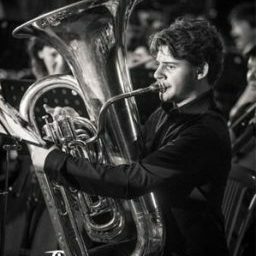 He was the first tuba player to win the prestigious Price “Nino Rota”, 2015 previously attributed to artists like K. Ricciarelli and J.Horowitz. Started trumpet in the high school of music “Jan Kukuzeli” in Durres, Albania. 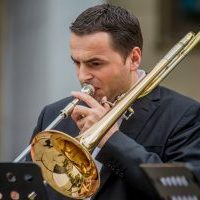 After graduation for trumpet in Academy of Arts in Tirana and Master for trumpet in Tetova University, he won a Full bright scholarship at the Truman University, USA (2010-2011) He worked at the National Opera and Ballet from 1991-2005 and after in the University of Arts like Pedagogue of Trumpet and Chamber Music. 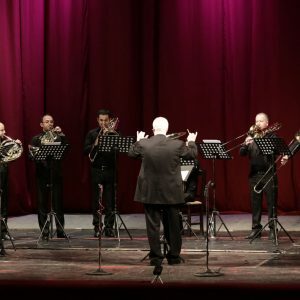 He is too activ not only in Albania like soloist, member of orchestras, or co-founder of brass quintets “Desaret Brass Quintet and “Tirana Brass Quintet”. He attended master-classes and share his experience holding master-classes for students in many countries contributing in increasing the artistic level in all the area. 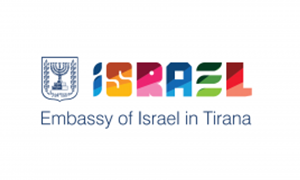 Iris was born in 1986 in Korca Albania. She took her first lessons in piano in her hometown from the year 2005-2009 at music school“Tefta Tashko-Koco”. After her studies at Academy of Arts in Tirana with pedagogue Ina Petrollari (2009-2012), she graduated Master Degree for Chamber Music. She had lessons with many profesors of pianio in foreign countries like: Prof. Y. M. Galea Malta, Prof I. Ursula Viena ect. Iris is active in many concerts in different cities and couontries like solist but also in chember music or accompanying voice choir. Actually she is piano Pedagogue at High school of music “Jordan misja” in Tirana. Tomislav has started to play trumpet at age 6. 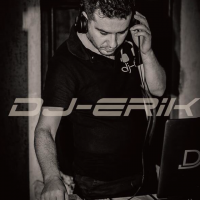 He finished Music Academy of the University of Zagreb. 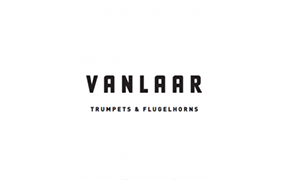 During his studies he attended numerous masterclasses of eminent trumpet players (Steuart, Tarr, Dokshitzer, Groth, Nilsson, Touvron, Vizzutti, Thibaud, André, Tarkövi, Agnas, Hardenberger…), and after his studies he took private lessons with T.Plog, P.Thibaud, G.Geiger, D.Baldwin and T.Reiner. 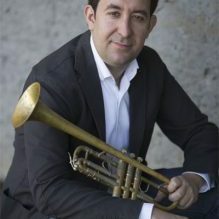 He is constantly seeking for broadening trumpet repertoire so he is cooperating with numerous composers and has initiated a lot of new compositions wich are dedicated to him (E.Ewazen: Trio for trumpet, cello and piano, J.Stephenson: Trio „Croatian“ for trumpet, flute and piano, L.Saglie: Sonatine, A.Klobučar: March, S.Stojanović: Trio No.9 for trumpet, violin and harpsichord, H.Wessman: Sonata for cornet…). In 2008. He gave a New York premiere of E.Ewazen’s Trio for trumpet, cello and piano at Juilliard School of Music and in 2014. He also found a forgoten work Elevation Op.71 for trumpet and organ by croatian composer who lived in USA B.Kunc. 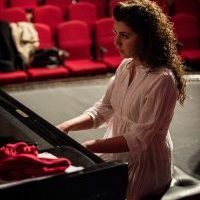 Born on 24 February 1993 in Korçë, Albania, Jonida Lazellari started to study piano when she was six years old at “Tefta Tashko Koço” School of Music. She holds a Bachelor and Master Degree in Piano, graduated in July 2016. During these years she has participated in several national piano competitions, where she was awarded first and second prizes. She has also participated in different festivals, like “Pianodrom”, the Festival of Young Composers, ” Remusica” etc. Jonida has been a participant in all masterclasses held in the University of Arts, where she took lessons with Heribert Koch, Johannes Maria, Adam Wibrowski, Lucia Passaglia, Dimitri Vassilakis, Marcel Worms, Pierre Reach, Gabor Eckharadt, Desar Sulejmani, etc. 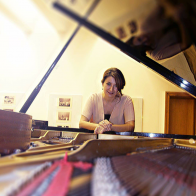 Actually she works as a piano accompanist in the University of Arts in Tirana.